Adam Ustynowicz a documentary filmmaker, author of movies filmed from the orbital station ISS, created a Christmas carol showing beautiful images of different parts of the Earth seen from space. The company Atende Software, developer of the largest content delivery network, supported the director and had become a technological partner of a carol, which had its world premiere via the social media profiles of selected NASA astronauts. Yesterday during organized by KIGEiT II Forum of Technology Networks Security, redGuardian system was awarded with "The Bronze Gate". This award is dedicated to companies offering security solutions for technology network and implementing projects aimed at solving complex security aspects of ICT systems with particular emphasis on the protection of SCADA systems and data protection in technology networks. The award is recommending innovative and effective solutions in the field of IT security and cyber-security for technology network. redGuardian is a cloud-based DDoS (distributed denial of service) attack mitigation service. It leverages dataplane software-based platform, developed by Atende Software engineering team. It offers 100 milion packets per second throughput on a single PC, which is 100 times more than generic OS networking performance. "The Bronze Gate" statuette was received by Przemysław Frasunek, head of Atende Software Security Systems Department. Atende Software has signed an agreement with Orange Polska for access to a content PoP platform. The contract covers the provision of datacenter space and 10 Gb/s ports in six most important regions of Orange network for the needs of redCDN nodes. “The presence of the nodes in the Orange network is the next step of the redCDN development. Partnership with telco operators allows us to optimize access to video content by moving it closer to the end user” - says Przemyslaw Frasunek, head of Multimedia Solutions Department at Atende Software. Atende Software is a developer and operator of redCDN – the largest content delivery network in Poland, used by such internet television and radio operators as: TVN, Cyfrowy Polsat, TVP, ITI Neovision, P4, Multimedia Polska, Vectra, EuroZet. redCDN serves up to 300 Gb/s of multimedia traffic every day. Last week Atende Software participated in European innovation fair - Brussels Innova, presenting its revolutionary approach to designing utility intelligent metering equipment for Smart Grid. Data Concentrator Unit with balancing meter functionality, built like a computer - basing on one simple processor and operating system, allowing to transfer all the functionality to the software, submitted to the Brussels Eureka Competition was awarded a silver medal. Last week Phoenix Systems was presenting its solutions at the largest in Europe fair for Utilities - European Utility Week, which this year took place in Barcelona. 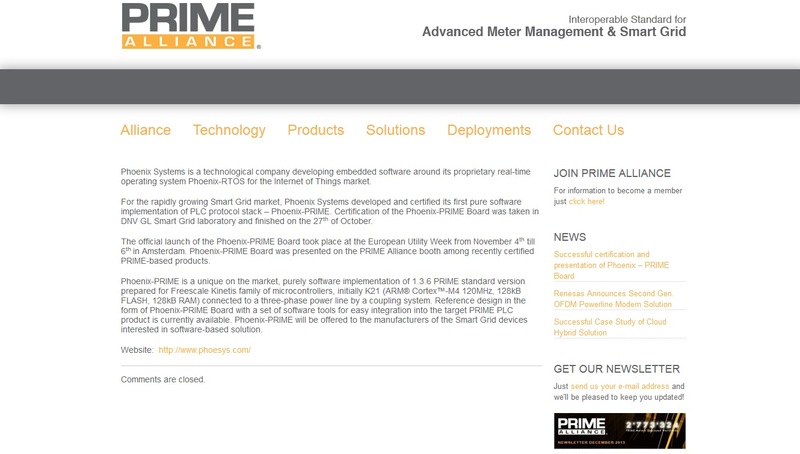 Phoenix Systems as a partner of NXP corporation was a guest in their exhibition space - Smarter World Tour truck, presenting real-time operating system Phoenix-RTOS implemented in proprietary measuring devices (smart meter and Data Concentrator Unit with balancing meter functionality) which are the basis for Smart Grid. 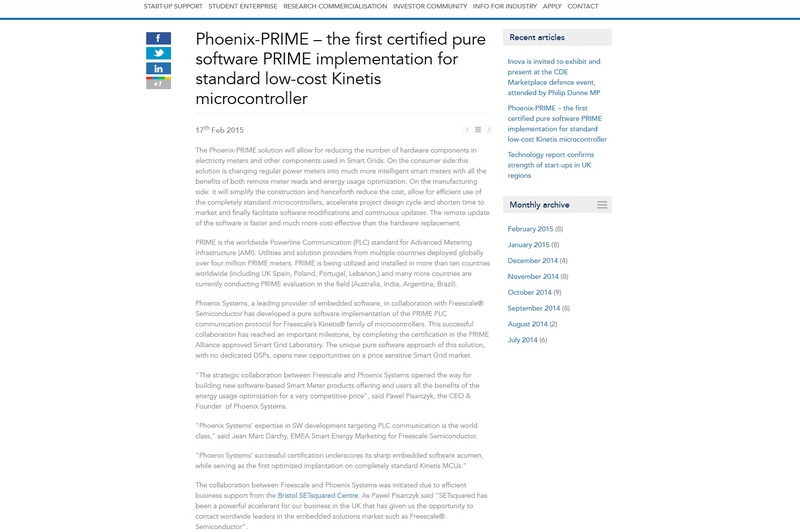 The company demonstrated as in the previous years, author implementation of PLC PRIME protocol used by the smart devices to communicate by high voltage power lines, offered under the brand Phoenix-PRIME. As a result of the bidding procedure from 7 July 2016. Atende Software has signed two-year contract with Energa-Operator for service, support and development of Central Database of Measurements - a key component of AMI System. The Database consists of created by Atende Software Systems - Meter Data Manager (MDM) and Meter Data Gateway (MDG). The main objective of the Database is data acquisition from the measurement infrastructure, collection and processing of measured data (gathered by both automatic and non-automatic meter reading) and communication with external systems. "Even with the best equipment, no one will climb Mount Everest, without knowledge, passion and the belief that this is possible.” writes Paweł Pisarczyk, CEO of Atende Software. Dziennik Gazeta Prawna has prepared a special edition under the title "No future without entrepreneurship." The most respected entrepreneurs on the Polish market and the authorities of the country were invited to participate in the edition. President Andrzej Duda and Deputy Prime Minister Mateusz Morawiecki spoke about the future of Polish industry and economy. Pawel Pisarczyk took polemic on creating innovation with the entrepreneur Zbigniew Jakubas, in which he presented his unconventional approach. The entire article can be read on Dziennik Gazeta Prawna.